I always politely laugh off these remarks and questions in the real world. However, since this happens to be my blog and here I’m not obligated to laugh or even be all that polite about it, I can just give the straight up honest answers that go off in my head when this happens. Because I know you guys can take it. Do I ever think about going to culinary school? Never. Not once. It’s a notion that has not, nor ever will be a possibility in my life. For one, culinary school tuition is not cheap. I already signed my life away in five years worth of student loans for my B.A. degree- I’m still trying to get it back now in the small loan re-payments I make now every month. Signing off on more loans to go to culinary school? Ain’t nobody got time for that. Second, culinary school is not something I would ever want to pursue because for me, shaping the act of cooking around the very regimen and structure of school would completely take all the fun out of it for me. When I cook for myself and my family, I like having the freedom to not only add or take away from a recipe as I see fit, but also to mess it up. In culinary school you learn so-called rules of making this and that, having to add this many ingredients, and these exact seasoning with very little wiggle room for freedom and personal interpretation of a dish. And if you do make a mistake and blow a dish, you could fail a mid-term or a final. Where’s the fun in that? Would I ever open a restaurant? Heh. Honey, you couldn’t pay me enough to do that. Long, endless hours of thank-less work. An almost guaranteed loss in profit in the first 1-2 years. Disgruntled, rude customers. The stress of continuity in putting out good food. Just a few reasons for me to steer clear of the restaurant business like it’s the Plague. I would want to have a life outside of my restaurant- most restaurant owners don’t. I want to be able to see my family on a regular basis- most restaurant owners don’t. I don’t do so well with failure- statistically speaking, most restaurants go belly up. There are virtually no pros to balance out those cons, at least not for me. A restauranteur, I am most definitely not. Do I want to go on tv shows like ‘Chopped’ or ‘Master Chef’? H-E-double hockey sticks, NO! No. No. No. And, uh no. I don’t do very well cooking under pressure,much less the added pressure of cooking on national television. Although it would certainly be nice if I did get to win one of those contests,the emotional repercussions if I didn’t wouldn’t be pretty. I’m a really sore loser, folks. Plus, if I had to cook for celebrity chefs (several of whom I really like and revere) and they didn’t end up liking my food, I would seriously give up cooking for the rest of my life, no joke. Why put myself through all that? 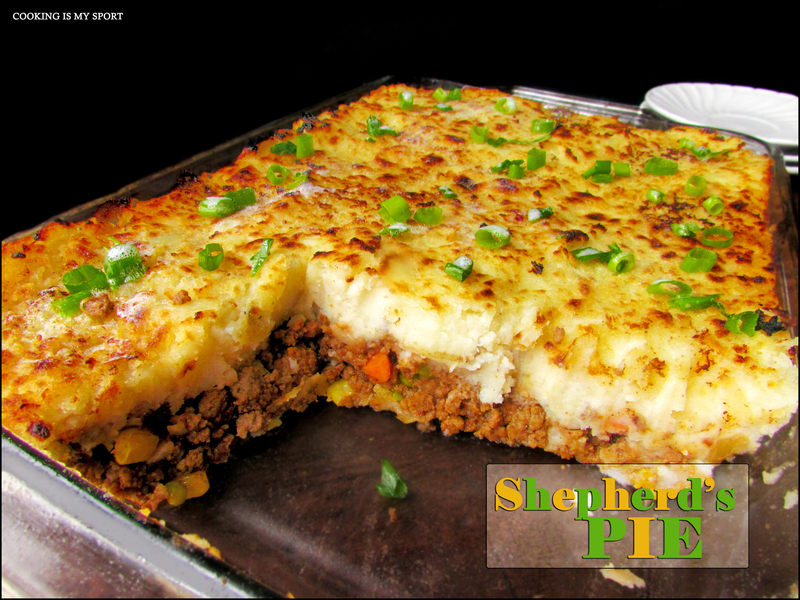 It’s fall, and that means you have to have a shepherd’s pie. Seriously: you HAVE to. I keep mine pretty simple; it’s a real meat and potatoes kind of dish-literally. If you’re not in the mood to make mashed potatoes from scratch, then please feel free to use the potato flakes you can microwave- I’ve done that in the past and the dish still comes out perfectly fine. We also don’t add cheese to ours, but I know that most people do, so I added it in the recipe. My only regret is that I didn’t make some brown gravy for these pictures, because that’s how I serve it to my family. This is pure comfort food, folks. No frills, no fancy stuff. But it sure is good for what ails you on chilly winter nights. 2. Set a large pot of boiling water over the stove. Cook potatoes, fully submerged in water for about 15 minutes, or until they are fork tender and drain. 3. Mash potatoes using a potato masher (or a mixer fitted with paddle attachment). Don’t worry about making them completely smooth– lumps aren’t a bad thing here. Add the heavy cream, butter, 1 tbsp. garlic and onion powder, and 1/2 tsp garlic salt and pepper. Taste and adjust for seasoning if need be. 4.Brown beef over stovetop, then add mixed vegetables beef broth, Worcestershire sauce, remaining garlic and onion powder, sugar, basil leaves, Ground thyme and garlic salt and pepper. Bring to a medium high heat and allow to cook for a further 10 15 minutes, or until most of the liquid is absorbed (it’s okay if there’s a little bit left). Taste and adjust for seasoning if needed. 5. Spray a 9 x 13 baking dish (or any casserole dish) with cooking spray. Spoon meat filling into bottom of dish, then spread mashed potatoes over the top. Make sure potatoes completely cover the meat to prevent any juices from bubbling up and spilling over. 6. Bake in preheated oven for 30 minutes, until potatoes begin to barely brown across the top. Remove dish from oven and turn on broiler. 8. Spray the potato layer with Butter-flavored cooking spray, or dollop with unsalted butter. You may also add cheese here if you like. Place dish back into oven, directly beneath the broiler and allow to cook a further 1-2 minutes, until potatoes are golden and browned. Your answers to those probing questions are great. I feel the same way, I would love taking some courses though, not for credit just for me. 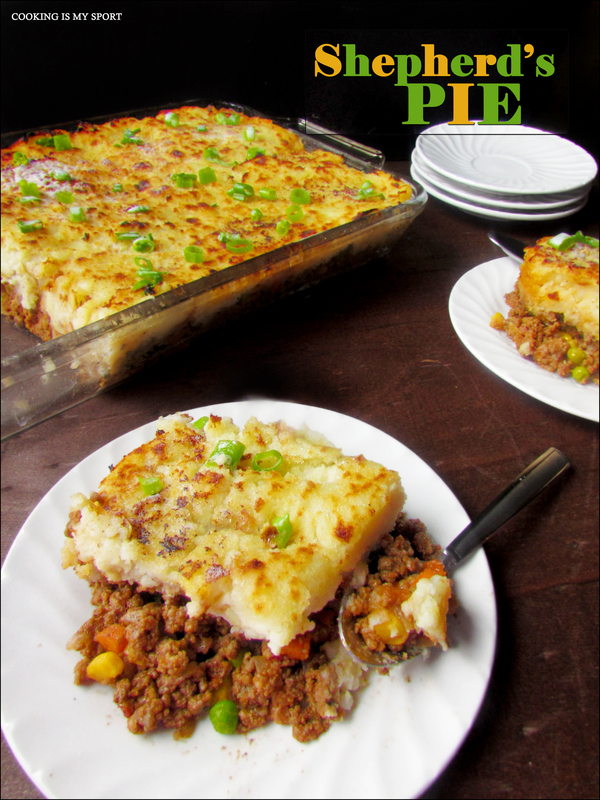 Love your shepherds pie, it’s such great comfort food and brown gravy with it yes please. I don’t use cheese in mine either. What a great post!! Hahaha I hear ya on ALL three! I second that H-E double hockey sticks No on all three!! Oh! and of course the shepherds pie- yuuummmm!! 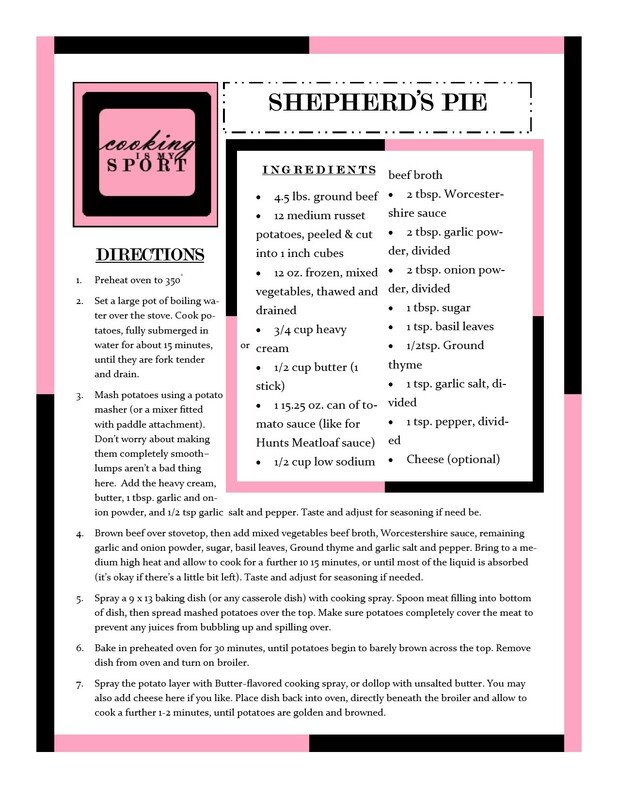 My hubby was just saying how much he loves shepherd’s pie! Yum! I’m so with you on the whole culinary school thing.. I can’t afford it… And I like to do things my way. I could almost see me showing the instructor my tricks!! I can relate to all these points. I love cooking, experimenting in my own time, in my own kitchen. Even cooking for a big group stresses me out. I can’t imagine competing or cooking professionally. Some things are more enjoyable when they are not work. 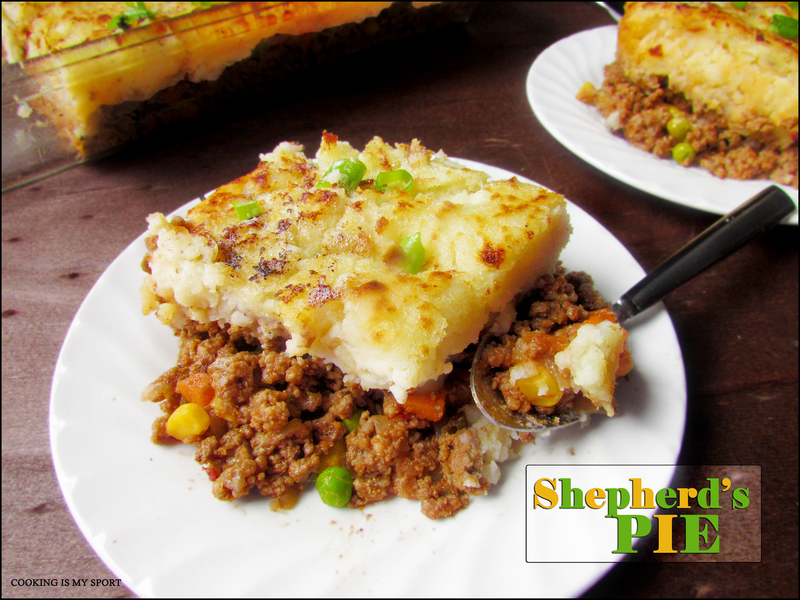 Shepherd’s Pie is one of the favourites in our house and a wonderful lunch the next day. It is Spring here in New Zealand but it’s cold today. I would love something hearty like this. What a lovely recipe! Will have to try it out soon. I love this post! I have had friends who said I should open a restaurant too, and like you, I laugh it off. I cook for pleasure, enjoyment and I don’t really have a style of cooking. I also used to be the office manager in a posh Italian restaurant…it’s not easy nor cheap to run a restaurant. I’ve seen and experienced the “behind the scenes” of running a restaurant and I do not for one second envy the owner! Stressful! I get all the same questions and my answers are all the same as well! That and of course time. No way could I fit it in my schedule with three kids. An occasional class is always welcome though. 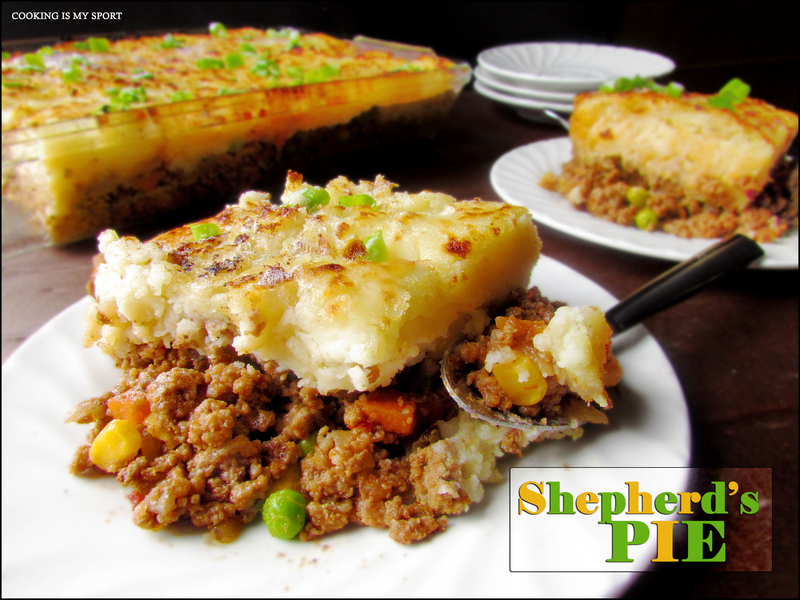 As for fall, this shepherd’s pie looks perfect for a cool and crisp evening. Haha 🙂 Chomp Chomp drooool droooool…….